Ping with Dir Browse and System Controls. If you are needing to ping several systems on the same subnet this tool makes it extremely easy to do so and troubleshoot your network issues. If you are needing to ping several systems on the same subnet this tool makes it extremely easy to do so and troubleshoot your network issues. This is macro enabled so that you can use this as well to shutdown or restart programs based on your need. ...... need. If you have a macro you can use it with this tool to automatically reboot the comptuer (forced) in order to restart a dead server connection. This can be very useful for automative processes for server admins or for systems running processes for long periods of time and may lose connection while you are away. Simply have your macro force restart the system and have a chance at reconnecting the computer. PTZ Camera controller software for Pocket PC. iTunes alarm clock. Simple to use, reliable, and packed with cool features. Desktop locking security utility to protect desktop when you are not near PC. Multi-featured Ebook, Queen Hynde by James Hogg. Thrilling Scottish verse story. For Internet Caf�s or computer kiosks. Sell passwords to computer or record use. Produce a wide range of wild crunchy percussive tones. Qweas is providing links to Queen Controller 4.3 as a courtesy, and makes no representations regarding Queen Controller or any other applications or any information related thereto. 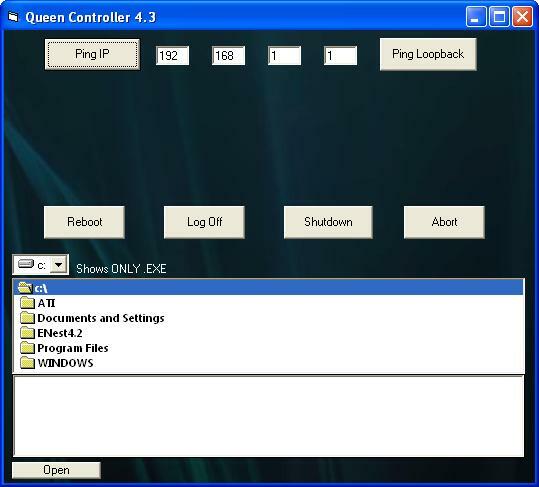 Any questions, complaints or claims regarding this application Queen Controller 4.3 must be directed to the appropriate software vendor. You may click the publisher link of Queen Controller on the top of this page to get more details about the vendor.